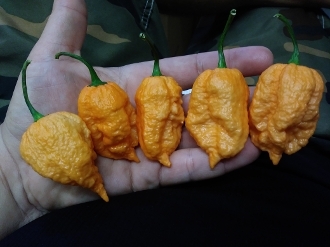 This listing is for ONE (1) pack of The Peach Ghorpion (Ghost Scorpion) Seeds! Each pack contains 20+ seeds. This variety will grow from seed to harvest in approx 175 days. The peppers will mature from Green to Peach/Light Orange in color. The Peach/Light Orange varieties are AWESOME for making spicy fruit jams/jellies, as well as most ANY seafood dishes, and HOT sauce!! Order some and try your hand at growing them in your garden! !